Heart of Darkness is a small book. Tipping the scale at just over a hundred pages, it's more a novella than novel. That does nothing to take away from its weight. For in those hundred pages is contained a descent into the mind of man. Isn't that where the real Darkness is, after all? Told as a monologue through the voice of one Marlowe, an introspective sailor, Conrad tells a story that's little to do with sailing and everything to do with human nature. The protagonist, Marlowe, heads off to Africa on a lark, to captain a steamboat up the Congo river on behalf of a Belgian Trading Company engaged in the ivory trade. His real mission is to discover the fate of the Company’s star ‘agent’, or trader, one Kurtz, whose spectacular performance has made him both feted and envied throughout the company. In the course of the next few months, we are given an insight into the worst of Imperialist Europe – the rapacious disregard for nature, the hopeless inefficiency of the Trading Company, the callous disregard for life, especially of the natives. In essence, that’s all the story we have. It is also all the story the book needs. For all through, it is nature that remains unchanging, Africa absorbs the white colonists and digests them, leaving them broken, mentally and physically, mere shells of themselves. But fuelled by ambition, we see the worst of depravities committed by them, including those like Kurtz, the worst of them all, a man who shamelessly raids rather than trades, who is a cold-blooded killer, even a Kurtz, who started off the most idealistic of them all, an intellectual, and artist and a poet – and this is what makes us ask the question of whether the colonial traders' avowed intentions – to civilise, the educate, to modernise – were broken by reality, or were never the true intentions in the first place. Was it the people who represented Imperialist Europe – the Agents, the Residents, the merchants - who committed the atrocities on Africa (and Asia) or was it the philosophy itself that was flawed, so dangerously flawed that it broke the Imperialists as it broke the colonies? It's difficult to write more without giving away plot points, so this must be a short review of a short book. 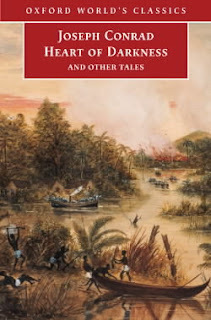 More than ever, Heart of Darkness reminds us that India too was an Imperial Colony for a long time, and had suffered in it's turn, much as the Belgian Congo. But there's no doubt that the Darkness that was colonial India is even more deep, dank and dangerous today. Conrad's Africa, at least, was being ravaged by a foreign invader. Today's India (and today's Africa too), suffer as much as they ever have, and we don't need a Kurtz to come from Europe to do it; we have raised a veritable army of home-grown Kurtz's. In the ultimate analysis, Heart of Darkness is not about Marlowe and Kurtz. It's about the Darkness that engulfs all of us, the madness within, the evil that manifests under the veneer of good intentions. Verdict: Must read. Available here.